Sarah’s Story: A Story of Personal Triumph and Spiritual Growth is a work of fiction built upon serious issues by author Danielle Aitken. Taking a close up look at infertility and the process of IVF, this life drama follows Sarah Johnston as she grows up in Australia with dreams of motherhood. With partner Matt, Sarah undergoes the trials and embarrassments of discovering their infertility as a couple, and onto the rigors of the IVF process as they continue to try for a family of their own. Beyond that, however, is the real story: one of personal growth, acceptance and self love that really gives the piece its heart. Author Danielle Aitken knows how to craft a real tear-jerker of a story, taking readers deep into the process of conception when biology is against you. It’s clear that Aitken knows a great deal about the IVF process, and that expertise is put into heavy detail to really show readers the difficulties that Sarah and Matt experience in order to have something which comes so naturally to so many others. The prose is well written and gives a strong sense of what’s going on in Sarah’s head, and the profound realizations which she comes to in the latter half of the book really turn the narrative in an unexpectedly beautiful way. 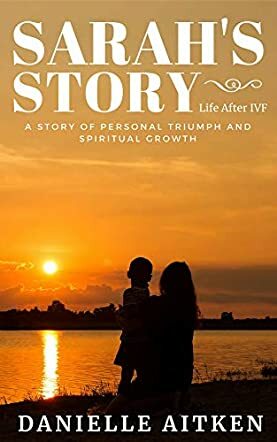 Overall, Sarah’s Story: A Story of Personal Triumph and Spiritual Growth gives a true account of the dramas of life, but also gives hope for the strength and resilience of the human spirit against adversity. Get the tissues ready, a really fantastic read, factual and emotional, could not put it down. This book takes the reader through all sorts of emotions - happiness, sadness, despair, understanding, and elation at the final outcome. It is well written and researched and is a must read for book lovers - male or female - who want a page turner. It is a real tear-jerker especially towards the end. I can't wait for the next book. Well done, Danielle.